I have been lurking The Grand Halls of the Gnatterbox for some time gnow, and have finally gotten into the action. Although I read about Gn15 quite a bit, I am currently modelling in 1 scale/1:32 minimum gauge. (I think you all would call this 1n15/1n16? It's 1:32 stock on 1/2 inch/12.7 mm gauge). However, for all of my models, I scratchbuild exclusively in card. For example the wheels are rolled around cotton swabs which spin in paper journal boxes while the rails are several layers of paper glued together, glued to paper sleepers. Below is a gnew 1n16 layout I made around Christmastime. It was just a "quick and dirty" experiment, but here it is. Anyhow that's all I have for gnow that comes to mind. Also, for that experimental layout, what a industry or backdrop etc. should I add? Welcome Chris, thats some pretty impressive stuff you've done there. Is the loco powered? Paper everything? Looking at the photos that's quite some achievement. Hello Trevor, to answer you, I use my trusty ol' 0-5-0 switcher for all duties. Perhaps one day I'll get some battery powered loco to run on them paper rails. 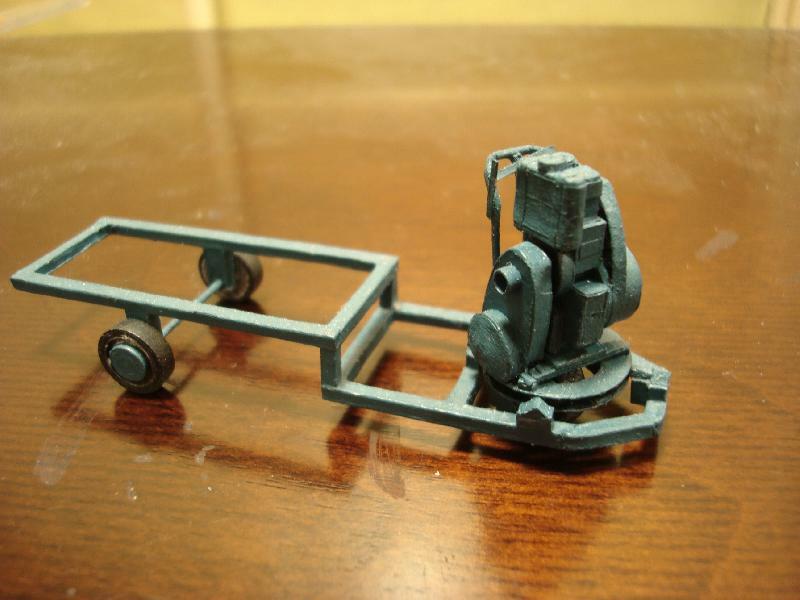 However, that might require a change in scale as the trammer's frame is only 7/8" x 1 3/4" (22mm x 44mm). I'm not sure if it it's physically possible to even put a motor chassis into a frame that size! Thanks for the comments, I look forward to joining the Gnatterbox community! Really impressed with your models and then I read that you work in paper ! Like that you even make your own wheels. One of the reasons I chose Gn15 is that I don't have to make any wheels. Seeing your Dalek, are you planning a Tardis any time in the future (or the past) ? Probably even room for a couple of batteries and a remote control system if you really wanted. I do realize that everybody has different skill sets so I will understand if you do not want to go down that track. After all it is YOUR railway. Hello Adrian, thanks for the comments! 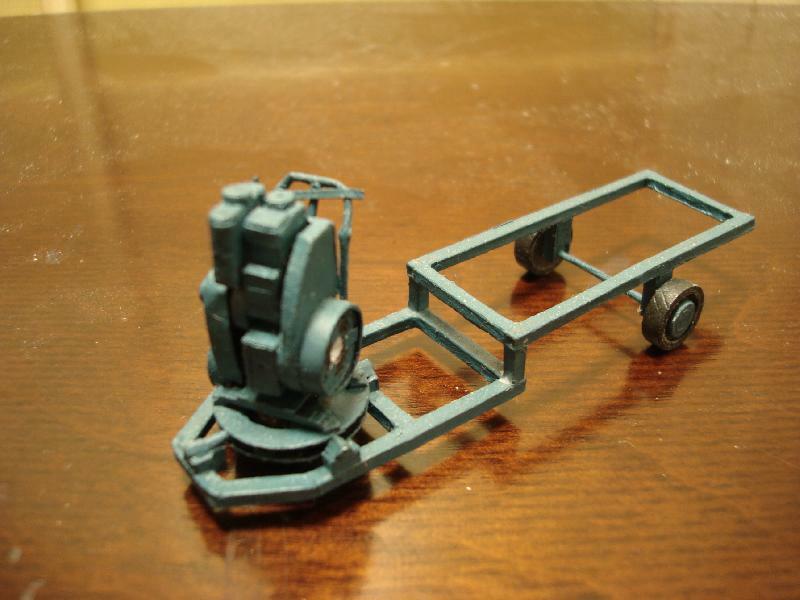 Speaking of wheels, do you or anyone else know if other Gnatterboxers have ever scratchbuilt wheels? 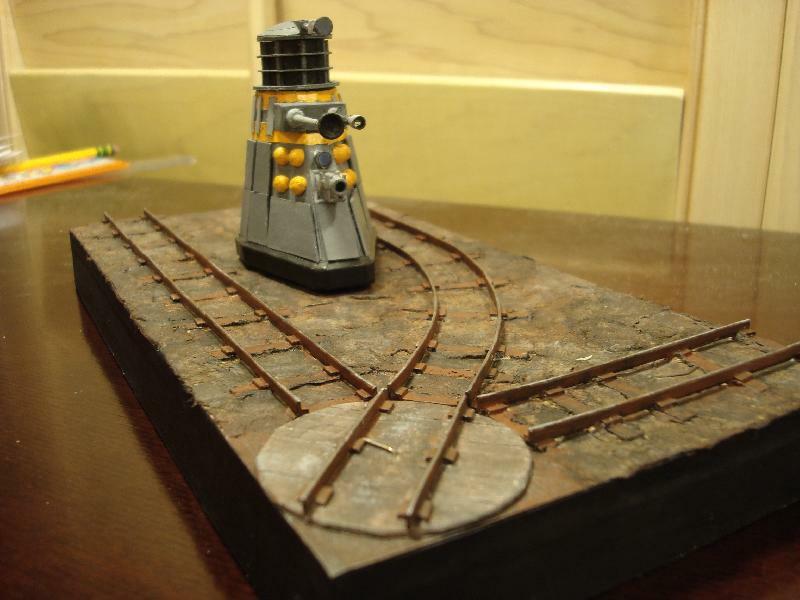 Also, now you've made me want to build some layout just so I can put a Tardis in it somewhere. do you or anyone else know if other Gnatterboxers have ever scratchbuilt wheels? I don't know of any Gnatterboxers who have scratchbuilt wheels although there is a gentleman who builds all wooden loco's and rolling stock out here in Melbourne. All highly polished and showing the raw timber finish. Although his stuff is all standard gauge and big it is beautifully in-spite of that. Maybe you have created a new level of Gnuttyness here ? Once built a Tardis in HO scale ---- made from about 2 dozen pieces of plastic, cut up into 'lacy' sheets before gluing them together. Don't really want to go through that again ! Although 1/24 should actually be a lot easier. 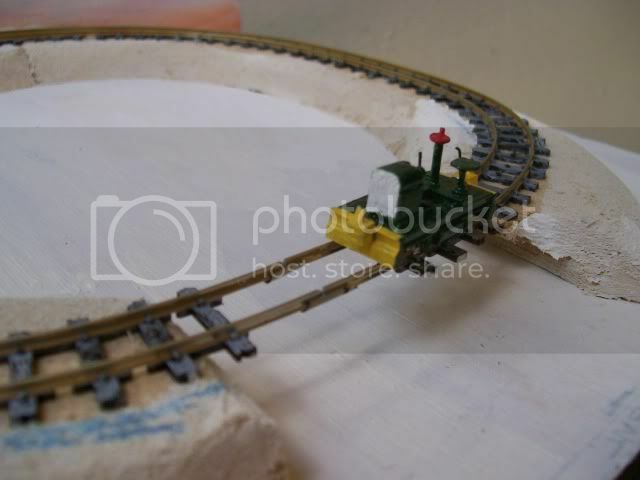 As for the T gauge, it's not immediately on my plan, but imagine the extreme narrow gauge, 1:32 on 3mm track that would be possible! That would give you about 3" gauge. 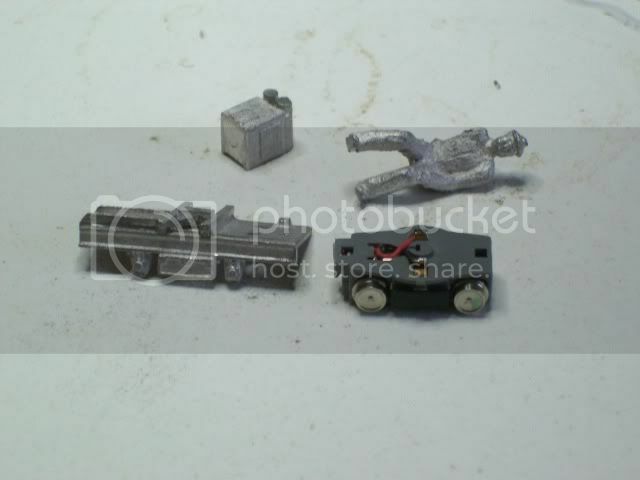 --- plenty of prototypes for that in the miniature railway scene. Didn't imagine using the track and chassis as such but more as demonstrating just how small motors and gearboxes have become. 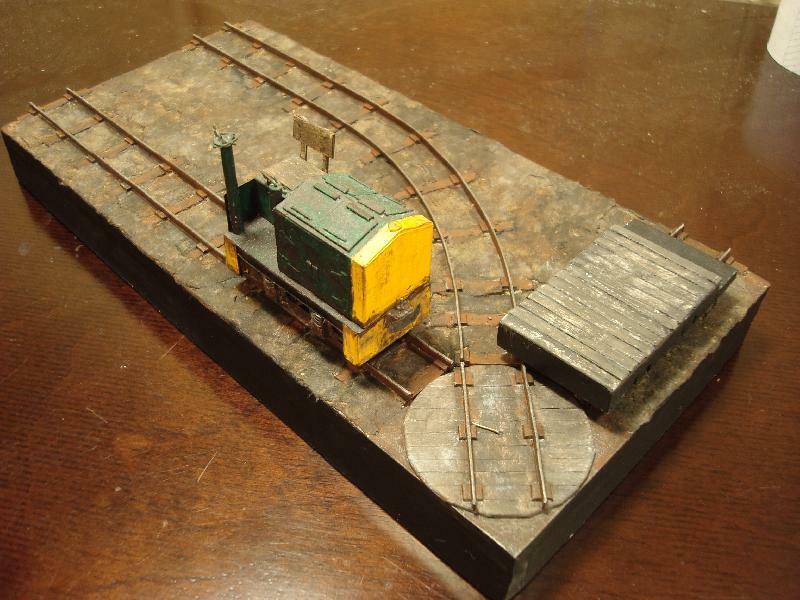 As an example I have a HO model of a simplex which runs using a commercial tram chassis that runs on 9mm gauge track. Hello Roger, thanks for commenting! which tram chassis is that? As for 1/64, I have tried it, but a bit small for what I want, so slightly upped that project to 1/55. The 1/64 project will continue but much more limited, possibly the loco I started plus a couple of wagons, depending how the 1/55 one progresses. Nice model, welcome to the forum. 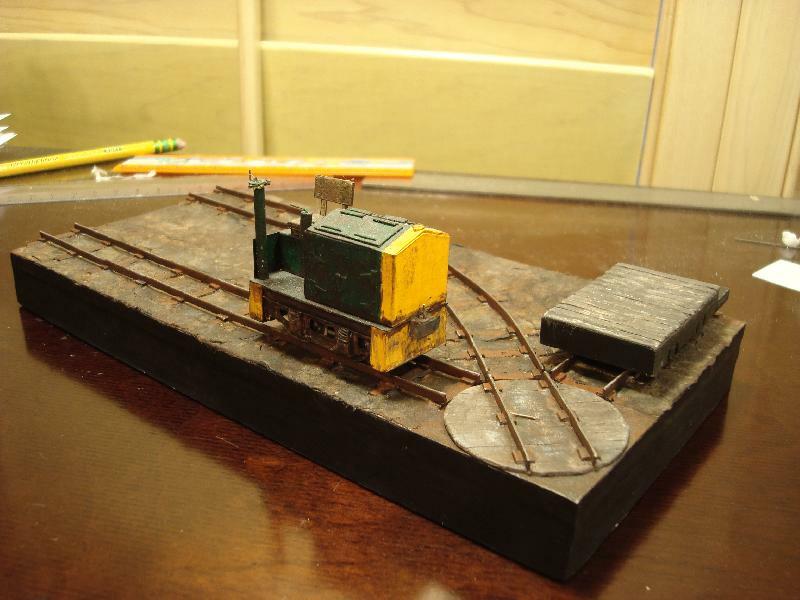 I finished it some time ago and it has done yeoman service on a small layout that I use on the exhibition circuit. This is the finished loco on the unfinished layout. The chassis is from the latest articulated KATO 14-801.4 Portram. It has two powered bogies, runs on 9 mm track on 12 volts. Not cheap but you do get two working chassis. 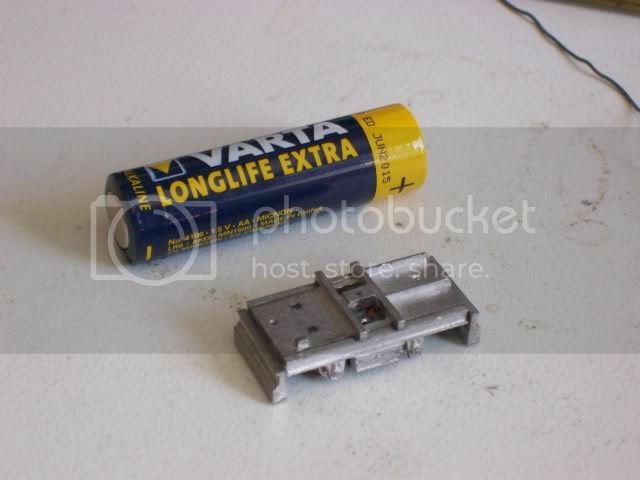 BUT each bogie has an electronic 'thingie' that knocks the motor voltage down to about 4 volts. The way that I have used the chassis is to remove all the external 'stuff' and just run the critter on 5 volts. The loco is an RT model's Lister loco kit from the Ffestinlog shop. Good job on the Simplex, thanks for the picture. Also, I apologize as I am unfamiliar with the term, but what do you mean by "yeoman service"? Paperengi wrote: Also, I apologize as I am unfamiliar with the term, but what do you mean by "yeoman service"? Basically, means it has been excellent. Very impressive paper modelling. What type of adhesive do you use, and do you treat the paper with a substance to stiffen it? Hello Stefan, thanks for the welcome! What type of adhesive do you use, and do you treat the paper with a substance to stiffen it? For Bridgette, the green battery trammer, the frame is card stock. the battery box actually has a foamcore structure with cosmetic card stock glued onto it. Details are cotton swab stems, staples, card, and thin wire. The buffer beams are card stock and filled with sand for ballast. For the Dalek, thin cereal box cardboard is primarily used. Printer paper is used for the details, including the hemispheres which were sanded to shape and cut off of tight rolls of printer paper. For Iseult, the Lister, the frame is made from printer paper folded and glued into a long, hollow tube which is used for stock material for the frame. The engine and details are also printer paper. Finally, the black motor flat car has a frame made of "slab construction". I took printer paper, and creating an accordion fold structure, and all the layers are glued together. In this way, I can have several layers of paper aligned and glued into a strip of stock material. These are cut to shape and stacked to form the frame and planks on the deck, creating a very solid/strong card frame. The ties were created from similar slabs as were the rails. The ground was done by layering brown wrapping/postal(?) paper which was crumpled to create the ground texture. For each of these, I used regular Elmer's school glue (PVA). Only rarely when I use foamcore such as for the trammer or layout bases do I use hot glue. I don't use any stiffener, but I find that if I have enough layers of paper, no stiffener is needed. In fact, if the slab style construction is thick enough, the entire slab begins to behave a bit like wood. For example, it can be sanded to shape. Finally, in case you wondered, all paint used is acrylic paint.